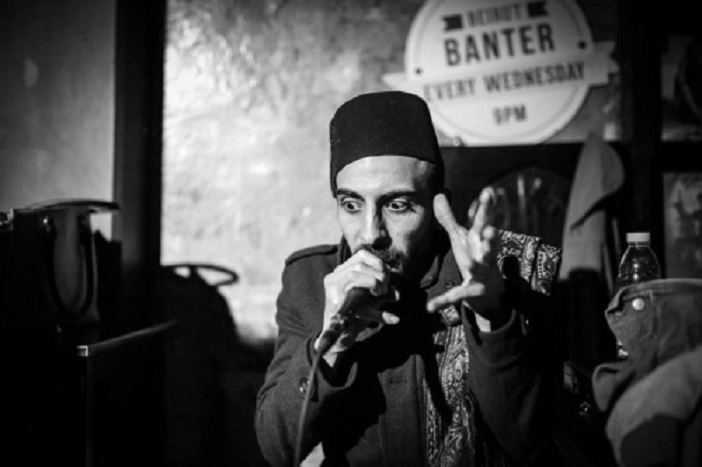 “Bilad El-Sham (The Lands of Damascus) is a movement, not a band”, emphasizes Assasi (in Arabic, “Essential”), co-founder of the oriental hip-hop fusion movement. His fez and fast hip-hop style is one of his trademarks. Assasi wrote his first lines when he was fourteen. A neighbour in his home city of Aleppo discovered that Assasi could rhyme, he encouraged him to continue his musical journey and in 2003 he had his first gig at The French Cultural Center of Aleppo. Assasi remembered how he felt: “It was an amazing experience, I had original lyrics and the audience were repeating the chorus.” The hip-hop scene was still a small community, and Assasi only belongs to the second generation of hip-hop artists in the country. Although he did not get support from his parents, he decided to be a hip-hop artist and become independent. The idea started to take form in 2008 when Khaled Arnaout decided to take hip-hop to the next level. Sharing this movement with like-minded artists from Syria and the region they started to perform together, and focused on hip-hop as a voice for unity, peace and open-mindedness. After Khaled Arnaout’s tragic death in 2010, Assasi took Bilad El-Sham as a platform to perform real hip-hop music in Arabic. Assasi describes what Bilad El-Sham means to him: “Everything I do with Bilad El-Sham is a tribute to Khaled. We can’t be united as a country so I show unity through the music.” The last time Assasi performed in Syria was in 2010, thousands of people attended the gig and he was overwhelmed by the turnout. The idea of developing Bilad El-Sham as a movement and not as a band resulted in the changes that occurred with different artists coming and going. After 2011, Assasi went to Beirut. During his time there, he started jamming in the streets together with friends. After they got a positive reaction on the street, Assasi started to think about taking the movement to the next stage, so Bilad El-Sham was reborn as a movement. They performed together during 2012-2014 and played eight shows together, along with appearances at festivals and events around Beirut. One of their first gigs was at Ta-Marbouta in Beirut. Almost a hundred people attended the concert and this was the next stage when Assasi thought they could do it. One of the biggest problems for this kind of musicians are that they usually tend not to get paid for what they are doing. Most of the time they are asked to play for free, even though it is their profession. Most of the people think that it is their hobby to play music but they depend on their music to earn a living and they cannot afford to play for free. Even though he lacks the resources to donate, he has continued to support causes such as the Fugee School in Malaysia with his encouragement and musical expertise. The topics the movement addresses are about issues that concern the society in general. They are easy to understand, because Assasi wants every one to be able to understand the content of what he is rapping. They discuss dishonesty in the media, youth emigration, and other social concerns. Assasi emphasizes that they don’t cover politics. People living in Syria know about the situation, and the civil war, they don’t need another hip-hop artist to rap about politics. That is why Assasi is trying to focus on social issues and not on political ones.